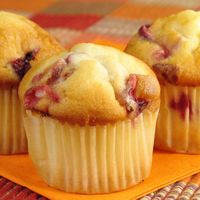 It is fall and time for some warm, fresh out of the oven cranberry and orange muffins! I added a touch of soho to warm up the mix and give it a bit of caramel flavor. Don't be scared, it tastes NOTHING like tobacco. If anyone would know its me (I can't stand any hint of tobacco). Fw blood orange is the perfect warm, earthy orange flavor to use in this perfect muffin base of flv lembas bread and flv pound cake. Lembas bread will be available from BCF in a couple of days. Give this a few days to a week to steep. The cranberry comes out a little more and the breads get more, well, bready. This recipe is the property of mlNikon and released under the CC Attribution-Noncommercial 4.0 license. You may not copy, derive or commercialize this recipe without following the terms of this license or the explicit permission of the creator. The muffin is...well, a muffin. I can't wax too poetic about what is essentially an unsweetened cupcake, now can I? That said, it is spot on, nice and doughy. The orange provides its usual tart sweetness, and is nicely balanced by the cranberry. Just a delightful PROINK of tasty tartness that nestles in very well. The surprising note for me is that caramel note from the soho. It gives things that well baked sweet note you get out of a good muffin. This stuff is banging. Now for the fun bit. I know Emily hates tobaccos, buuuut. Yeah, I cranked this bad boy to 430f while playing around tasting the various flavors, and it shifted from muffin to "Huh, sweet orange cranberry tobacco...interesting". Basically, the muffin fades to a low roar, and the nutty/woody notes you get in a tobacco show up, backed by caramel, orange and cranberry, with a faint hint of a cake baking. 2 for 1 deal. Awesome! Killer stuff!